Cars: You can find lots of “ready-to-paint” cars and trucks at the craft store! Accents: Any fun decorations that you want to add to your villages, like mini Easter eggs, turf or Easter grass, wooden cubes for flower boxes or mini wooden flower pots! 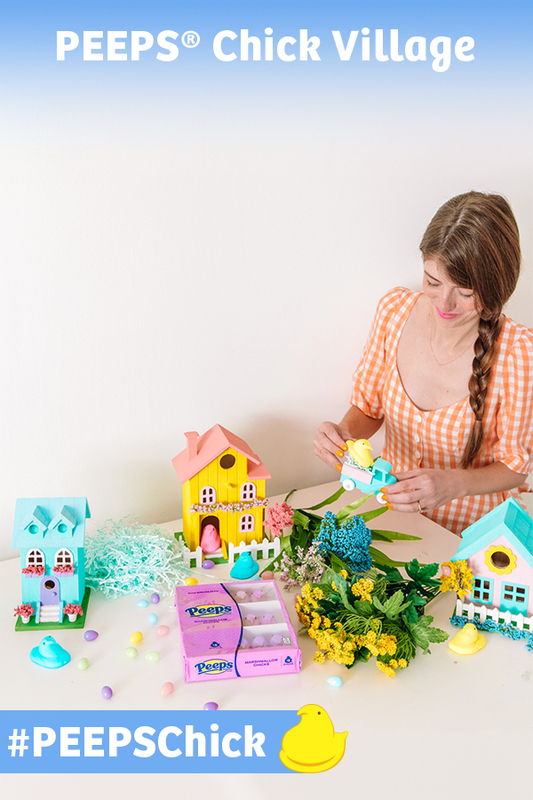 Paint a few of the birdhouses inspired by the PEEPS Chicks! Painted the base of the houses green so it looked like grass. Once dry, create little flower boxes using tiny wood cubes and attach them to the house with hot glue. Then clip little flowers off the bunches and glue them on top of the flower boxes. Add a little truck out front and turn the truck bed into a “nest” for a PEEPS Chick with some Easter grass! Add other Chicks to the display as the cutest residents of the neighborhood!